You have all the copywriting tips you could ever want and need at your fingertips thanks to the world wide web. And, you can sit down and go to town executing them all to write a hefty piece of sales goodness to reach your ideal customers. But, if you have no idea what to actually write to reel in those people and get those sought-after conversions, you’re basically tossing all the precious time you spent to ensure you end up with a long page of copy out the window. And, for what reason? So it follows typical sales page protocol that requires never-ending scrolling? And, no matter what the “experts” say, sometimes long copy wins, and sometimes short copy wins. So, what does it all boil down to? Well, that question is what brought me back to the blog today—to further explain what matters most in your sales writing. Because, as I mentioned in the headline, it’s not what you think. 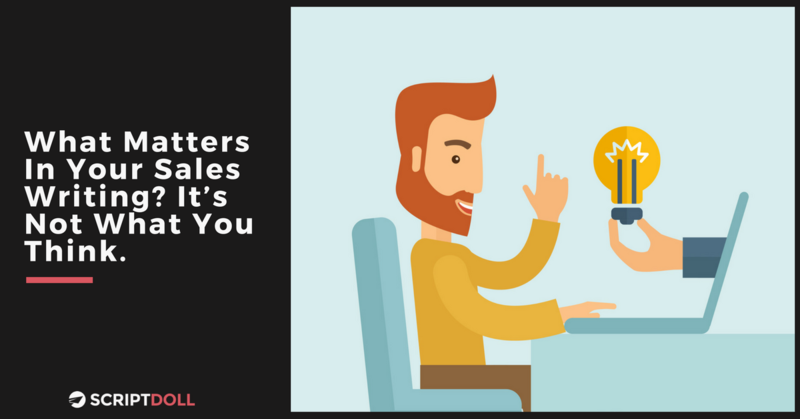 Here’s the answer to the infamous question: What matters in your sales writing? What you write is more important than how you write it. Yes, it’s true. As an entrepreneur turned sales writer for your product or service, your primary job is to make clear and compelling points with your words. You know, all so your ideal customers feel inspired not to delay their purchase any longer. You’ve sold them on the idea that they need your product or service to solve their biggest headache. Thus, they show you their wallet, and you earn those sales you want and deserve after all your hard work! Easier said than done, right? Absolutely. So, what does making clear and compelling points with your words really mean? It doesn’t have to do with using the biggest phrases or stale corporate gibberish. Or, even creating the longest sales page in the history of ever. Instead, it has to do with writing in a language your audience will not only understand, but also relate to. Therefore, your audience should be the focus of your sales copy efforts. To get to that point, however, you must take a step back and truly research and evaluate who you should be targeting with your message. When you’re aware of who you’re selling to, you’ll know how to speak their language. For example, are they someone who needs all the facts, data, and social proof they can get to illustrate why they need and should want what it is you have to offer them? If so, warm up your typing fingers and get them ready to run laps on the keyboard as you write your copy to address their most significant problems you’re helping to solve, speak the words they would use, and mention the benefits and results that would motivate them to buy. Once you hone in on your audience’s needs, it’ll help you figure out what length will work for you to make your point clearly and effectively—a long sales page or short sales page. If you’re leaning on the shorter end of the spectrum, refrain from trying to morph your copy into something it doesn’t and shouldn’t need to be. That just contributes to unnecessary fluff and filler that drowns out your message. Just take the urban legend of novelist Ernest Hemingway’s six-word story as an example. It is said that he won a bet by writing a six word short story that was so good, it could make people cry: “For Sale: baby shoes, never worn.” And, for decades since, it’s served as a writing prompt to test writers’ ability to create their own succinct masterpieces. In all seriousness, word count, grammatical errors here and there, text decoration, page length—who cares? Your readers sure won’t, especially if what you write offers up nothing but value and speaks directly to their hearts and minds. So, as you sit down to craft your next sales copy masterpiece, remember the following—it’s not how you write, but what you write that really matters. And, if you’d like to get ahead of the game and plan for your sales page success, I’m offering you a FREE copy of my eBook: “Who Is Your Perfect Customer? The Ultimate Guide You Need to Catch Them Today,” delivered straight to your inbox. All that’s required to get your hands on it is your email. Just drop it into the box to the right-hand side of this page, and you’ll get it no time! Have questions or something to share on today’s topic? Leave me a comment in the box below. I’d love to hear from you! Great post. Thank you. I need to review mt templates at remail.io.